All transactions are safe and secure with a reliable history in online purchasing behind each of our associates. 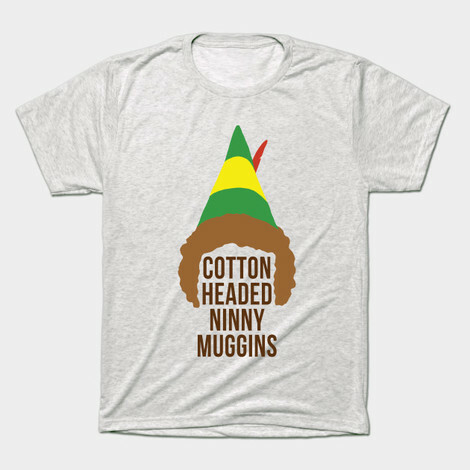 Buy the Elf Cotton Headed Ninny Muggins t-shirt to own Elf clothing and merchandise. Calling an acquaintance a Cotton Headed Ninny Muggins is one of the worst insults that one elf can bestow upon another. When Buddy (Will Ferrell) uses this label to emphasize his disappointment in himself, the elves around him gasp in disbelief. To most people, the term sounds more playful than insulting, which is what makes this Cotton Headed Ninny Muggins t-shirt so fitting. There's just something about the elf swinging on a bell that makes me smile. Perhaps we all have a bit of the Ninny Muggin in us. In addition to the Elf Cotton Headed Ninny Muggins tee above, browse the Elf Clothing Gallery for more apparel like men's and women's clothes, kids shirts or hoodies.